The importance of good aerodynamics in rainfall measurement! This research article, published in Water Resources Research, presents the culmination of many years of collaborative effort between EML and a number of different research organisations (see banner below for details). It provides quantitative evidence in support of the role that good rain gauge aerodynamics play in the accurate measurement of rainfall. The collaboration was initiated under the auspices of a Knowledge Transfer Partnership (KTP), a UK-wide programme to drive innovation in businesses which has been running successfully for over 40 years. The picture above shows the Hydro-Met site at Nafferton Farm, North East England, UK. This is one of the lowland research sites instrumented as part of the KTP project. As you can see, this site has many different rain gauges mounted at ground level in a pit (grey metal grid in the centre of the picture), and above the ground. Wind speeds and other meteorological parameters were also measured, at 0.5m and 2m above the ground. The pit rain gauges formed the reference rainfall measurement. There were three other sites in England and Scotland which had similar equipment installations, always with a pit gauge used as the reference measurement. 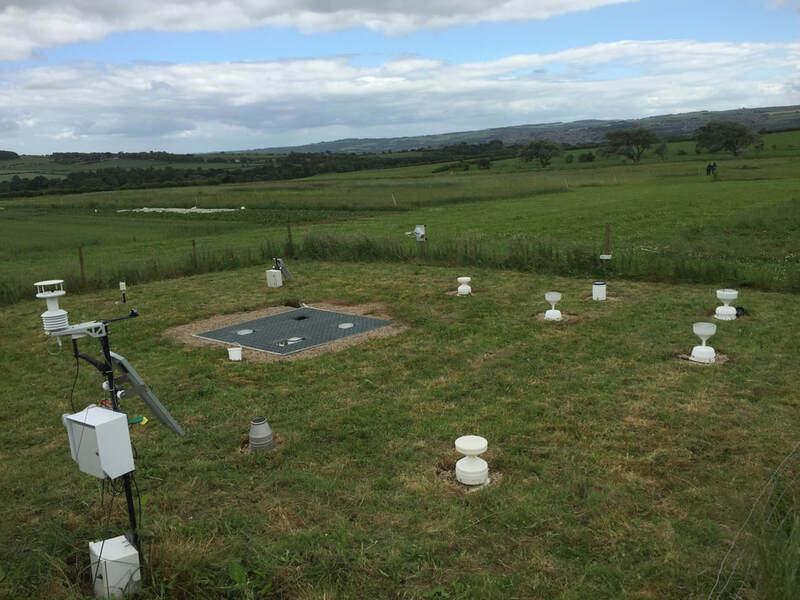 This study was motivated by how challenging it is to measure rainfall accurately, despite it appearing to be very simple. Rainfall measurement is important to society because it has so many everyday uses, such as food production and weather forecasting, and applications that are critical to life, such as flood warning and effective management of water resources. Rainfall is difficult to measure because it varies so much in time and space, and the measurement of rain is highly affected by how windy it is, which also varies in time and space. Therefore, when it rains at the same time as being very windy, which is common during many storms, rainfall measurements are greatly underestimated. The uplands generally receive more rainfall and higher wind speeds than the lowlands, therefore it follows that we underestimate rainfall by more in the uplands. This is important because rainfall measurements in the uplands are sparse, yet it is in such areas where many floods originate. This study shows that the underestimation of rainfall at a site in the windy Scottish uplands was more than 23% on average. It then suggests some techniques that can be implemented to improve the measurement of rainfall. To read the full open access article, click here. The top panel shows computer images of a straight-sided (cylinder) rain gauge. The bottom panel shows results of velocity and turbulence for the aerodynamic SBS500 rain gauge, used by the UK Met Office and Scottish Environment Protection Agency (SEPA).